The route was just reward for Robertson and Benson who had tried the line several years ago but were forced to retreat due to a sudden thaw. The topo shows the line of Minus One Direct (VIII,8). Integration (blue) moves left from the top of the lower snowy grooves (half-height in the picture) into the left-facing corner of Subtraction. 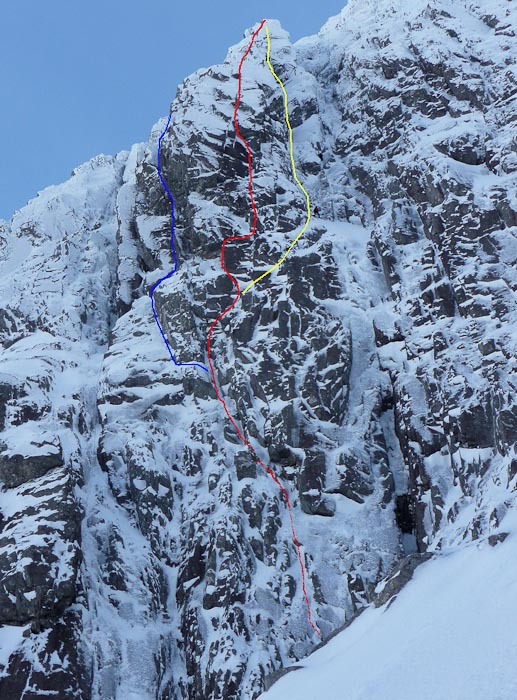 The original Paul-Muir line up Minus One Buttress (yellow) continues diagonally right in to the Meadow of Minus One Gully and then finishes up the right-facing corner on the right flank (above the figure belaying in Minus One Gully). Bullock and Benson, who are currently living in Chamonix, flew across to Scotland when they heard about the brilliant winter conditions. This one route was well worth the trip, but based on a tip-off from Robertson, they also made the third ascent of West Central Gully (VII,8) on Beinn Eighe a few days later. This entry was posted in New Routes, Topos and tagged Beinn Eighe, Ben Nevis, Guy Robertson, Minus Face, Nick Bullock, Pete Benson. Bookmark the permalink.